The City of Houston, Texas, home to the Manned Spacecraft Center (MSC), now the Johnson Space Center (JSC), became the inevitable location for philatelic space enthusiasts to gather and form a philatelic society first known as the Space City Philatelic Society. That name was later changed to the Space City Cover Society. When word was received of the tragic deaths of the Apollo 1 astronauts, Gus Grissom, Ed White and Roger Chaffee in January of 1967, the Society decided to document and remember this accident with philatelic covers. In the creation of the Apollo 1 covers and wanting to have them canceled by the Manned Spacecraft Center, the Society learned that MSC didn't have a post office or station on site or one in the immediate area in where the covers could be canceled. All of the mail at MSC and in the local area collected by the United States Postal Service was canceled at the main Post Office in downtown Houston. It was also learned that there was no specific Post Office cancellation relating to space exploration or the space agency. The Society at this point decided to create a local post and cancel for space events tied-in to the Houston space center. At the time, Local Posts were permissible under postal regulations and were very limited in their scope. Local Post stamps that were created could not be used to pay postage fees. In order to obtain a Post Office cancellation, the covers would have to bear valid United States Postal Service stamps in addition to the Local Post stamps. 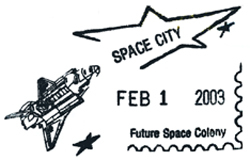 Since the emphasis of the Society was creating covers to document space events, the Society changed its name from the Space City Philatelic Society to the Space City Cover Society. SCCS created the NASA Local Post, which was not of any connection to any of the United States governmental space agencies. The first NASA Local Post issue was released on February 20, 1967 to commemorate the 5th anniversary of John Glenn's Mercury-Atlas 6 space mission. In October of 1979, the United States Postal Service changed the rules for "locals posts" operating in the United States. Local Posts could now create valid postage and provide a "local delivery service" for "extremely urgent" mail. The basic rules were that mail could be "dispatched" within a 50-mile radius of the local post with delivery occurring within six hours of receipt or by the close of the business day for the local post. One of key factors in the rule change dealt with the fees paid for private carriage of the "extremely urgent" mail. The fee was to be at least $3.00 or twice the applicable U.S. postage fees for first-class mail, including Priority Mail, whichever is greater. "Extremely urgent" mail was no longer required to have both U.S. postage and Local Post postage. The NASA Local post could now create and cancel its own covers without the additional postage costs and wait time for cancellations. This made the NASA Local Post stamps "valid for payment of delivery services" and were no longer considered "cinderellas" by collectors. In philately, a "cinderella" stamp is defined as "anything resembling a postage stamp, but not issued by a government postal or authorized agency for postal fees." In late 1979, the Space City Cover Society and the NASA Local Post formed the Space City Courier Service to formally legitimize the NASA Local Post. The Space City Courier Service adopted the "SCCS" initials and logo for use on its Private Express Mail issues. The Space City Courier Service was registered at the Harris County Texas Courthouse in Houston and became the second authorized user of the NASA Local Post. The only other authorized user of the NASA Local Post was the Space City Cover Society. Most of the SCCS covers canceled with the MPP were never placed into the USPS mail stream. However, the use of the MPP allowed a cancellation with any date, even those dates when the USPS was not in operation to cancel mail. Earliest known use of an MPP by SCCS was in July of 1974. SCCS used two different styles (Shuttle and "wavy" lines) of MPP’s in the cancellation of their NLP covers. SCCS also used an "Apollo", "Skylab" and "ASTP" MPP’s to cancel covers, but these three were not used on NLP Covers. However, it seems that the Space City Cover Society did not totally disappear as SCCS covers from 1983 to 1992 have been discovered. These covers featured an array of space related topics as well as non-space topics. None of the SCCS covers found since July of 1982 bear local post stamps. By the late 1980's and into the early 1990's, the use of the Space City Cover Society name was being eliminated, with only the SCCS initials and logo being used. By the end of the 1990's, the name "Space City" was replacing the Space City Cover Society name. The long time Space City Cover Society Post Office Box address of 53545, Houston, Texas, 77052, was changed to Box 36192, Houston, Texas, 77236. In January of 2010, the long-time president, Harry L. Anderson, of the NASA Local Post and the Space City Cover Society, passed away.